We’d love your help. Let us know what’s wrong with this preview of As the Ink Flows by Glenda Dekkema. A devotional by writers for writers, integrating the craft of working with words with the faith of people of the Word to deepen, sustain, and expand ministry in the world. This collection of 90 devotions features a focus Scripture, a brief meditation on the text and the writing experience, and a prompt for personal reflection and creative response. To ask other readers questions about As the Ink Flows, please sign up. As the Ink Flows isn’t just for writers – though that’s certainly its audience. All I write is a blog (lol) and I have been blessed by these devotions all the same. The five co-authors have written a total of ninety devotions that span six different sections, covering spiritual insights into the writing craft itself as well as into the writer. And above all, each reading, prayer, and exercise points back to THE Author, the One who started our faith and the One who will carry it to completion. A B As the Ink Flows isn’t just for writers – though that’s certainly its audience. All I write is a blog (lol) and I have been blessed by these devotions all the same. The five co-authors have written a total of ninety devotions that span six different sections, covering spiritual insights into the writing craft itself as well as into the writer. And above all, each reading, prayer, and exercise points back to THE Author, the One who started our faith and the One who will carry it to completion. A Bible verse begins each devotional, followed by a brief text written by one of the co-authors. Prayer closes each entry, as does a “Let the Ink Flow” section which continues prompts for writing development and personal reflection. I have been using this off and on for my own devotional time since receiving it from the publisher for review, and I really enjoy that the entries are uplifting and easy to read in a few spare minutes of time but are also quite profound and convicting and lend themselves to more extended reflection as well. The "Let the Ink Flow" section at the end of each entry will be invaluable for writers to take the applications of both the spiritual and writing craft truths one step further. If you are a writer… a blogger… a creative person … a speaker … a ministry leader … or you know someone who is, As the Ink Flows would be a phenomenal asset for your devotional needs. The devotions are quick to grab before getting ready in the morning, on your lunch hour, or during a writing break but are also full of profound truth that settles in the heart and points to Jesus. These co-authors love Jesus and love writing, and it shows, their different writing voices complementing each other and providing options for all sorts of preferred reading styles. As the Ink Flows is a unique book that will inspire writers with thoughtful devotions and challenge them to think more deeply about their craft and their Creator. I like the variety of topics that were chosen and the wisdom the authors shared. Writers will especially appreciate the reflection section that gives them space to process what they've read. I highly recommend this book to all writers who are looking for encouragement and inspiration. A must-have for Christian writers, As the Ink Flows inspires readers to simultaneously grow in their craft and spiritual walk. Glenda Dekkema, Melony Teague, Carol Ford, Claudia Loopstra, and Marguerite Cummings penned 90 devotions that convey solid and practical truths and advice. Each entry starts with a Bible verse, followed by a brief and relevant devotion, and concludes with a prayer. The authors make the experience interactive by providing readers with the opportunity to reflect on the less A must-have for Christian writers, As the Ink Flows inspires readers to simultaneously grow in their craft and spiritual walk. 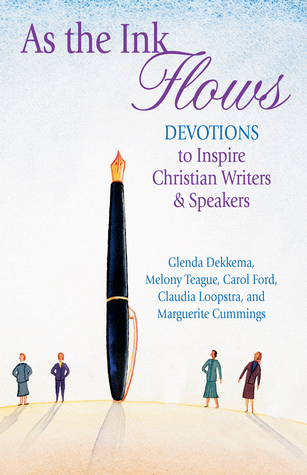 Glenda Dekkema, Melony Teague, Carol Ford, Claudia Loopstra, and Marguerite Cummings penned 90 devotions that convey solid and practical truths and advice. Each entry starts with a Bible verse, followed by a brief and relevant devotion, and concludes with a prayer. The authors make the experience interactive by providing readers with the opportunity to reflect on the lesson and explore it through a writing prompt. Furthermore, the entries are organized into sections that address various topics, including Inspiration, Well-Being, and Faithfulness. Through the years, I have used and greatly enjoyed numerous writer devotionals. However, I appreciated that the authors of As the Ink Flows took it a step further by also incorporating the element of faith. As believers, we possess a different worldview and that bleeds into our lives as writers. This book accounts for that, allowing us to embrace and grow in both of those areas. Brimming with uplifting and motivating nuggets of wisdom, it encourages writers of all kinds, regardless of expertise level, to pick up the pen and create. I heartily recommend this book to Christian writers and speakers. I advise grabbing a notebook and highlighters. You’ll want them! Ask the Ink Flows inspired and encouraged me to delve deeper into my relationship with God. The reflections and writing prompts that follow the devotions are sure to stir the creative juices of Christian writers and speakers. This book will also be a valuable resource for writing groups. Whether they are beginners or seasoned pros, writers and speakers of all types will find inspiration and gentle encouragement within the pages of As the Ink Flows. It's a breath of fresh air for the creative soul!